Surnames are much more than convenient identity tags; they are windows into our families’ pasts. Some suggest ancestral trades (Butcher, Smith, Roper) or physical appearance (Long, Brown, Thynne). Some provide clues to where we come from (McDonald, Evans, Patel). And some – Rymer, Brocklebank, Stolbof – offer a hint of something just a little more exotic or esoteric. All are grist to the mill for David McKie who, in What’s in a Surname?, sets off on a journey around Britain to find out how such appellations have evolved and what they tell us about ourselves. En route he looks at the surname’s tentative beginnings in medieval times, and the myriad routes by which particular names became established. 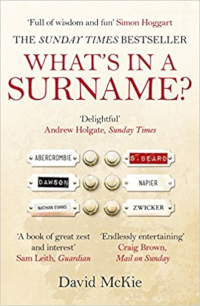 He considers some curious byways: the rise and fall of the multi-barrelled surname and the Victorian reinvention of ’embarrassing’ surnames among them. He considers whether fortune favours those whose surnames come at the beginning of the alphabet. And he celebrates the remarkable and the quirky, from the fearsome Ridley (the cry of which once struck terror in the hearts of Northumbrians) to the legend-encrusted Tichborne, whose most famous holders were destined to suffer centuries of misfortune and controversy. Elegiac and amusing by turns, he offers a wonderfully entertaining wander along the footpaths of the nation’s history and culture, celebrating not just the Smiths and Joneses of these islands but the Chacepots and Swetinbeds, too. “David McKie’s incredibly detailed research and his diamond-sharp prose make this book a delight, full of wisdom and fun”. “There are plenty of surname dictionaries available, intended for quick and easy reference. What’s in a Surname? is resolutely not one of those. This is a book for reading, and it is one that requires persistence. In many ways it is as gnarly as the names that have intrigued and baffled onomasts for centuries, and that is its greatest asset”.